Harry Wedge’s politically and emotionally charged work challenged perceived ideas about contemporary Indigenous art and Indigenous peoples’ experience of living in urban Australia. His aesthetic encompasses stories and humorous anecdotes from his childhood at Erambie Mission at Cowra, in the heartland of Wiradjuri country, satirically juxtaposed with present day experiences - the ongoing legacy of Stolen Generation issues, alcoholism, domestic violence, imprisonment and fractured psyches. Harold James Wedge, a man of the Wiradjuri nations, was born at Erambie Mission, Cowra in central- western New South Wales in 1957. 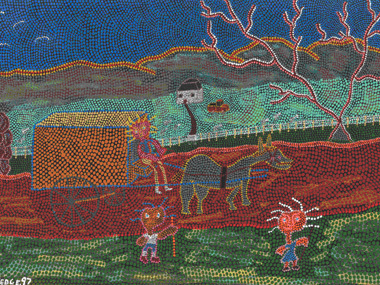 Throughout his younger years Harry worked as a drover and seasonal fruit-picker, but like many Aboriginal people in his early 20s he headed to Sydney to connect with family and friends and most fortunately of all ended up becoming an integral part of the nascent modern Aboriginal art movement that was asserting its place in the Australian commercial art industry. An interest in photography and a chance meeting with a cousin who was studying photography at TAFE Eora Centre, Redfern, led Harry to enrol. The Eora course structure led HJ, as he was often known, from photography to painting and he discovered a medium through acrylic paint to articulate his ideas, thoughts, observations of everyday life and his dreams. Harry’s political perspective was formed in the late 1980’s and galvanised through widespread Aboriginal community opposition to the national bicentenary celebrations – an experience far removed from the dominant narratives of the historically based anthropological versions of Aboriginal Australia that dominated academia and the popular media at the time. By the second semester of HJ's first year at Eora, his bold and expressive talent for storytelling through images was obvious. Although this was Harry's first sense of real achievement, the acclaim was a surprise to him as was his continuing development. As central desert motifs and the familiar ‘dot painting’ came to become recognisable symbols of Aboriginal art, Harry’s representational and diaristic narratives confronted many people’s expectations of what Aboriginal art and indeed what Aboriginal people themselves were supposed to ‘look’ like. The annual Eora Student Art Exhibitions continued to create much excitement and recognition for HJ's work and he began to exhibit in solo and group exhibitions including a joint exhibition with Ian W Abdulla at Boomalli Aboriginal Artists Co-operative in 1991. A solo exhibition at Tandanya Aboriginal Cultural Institute in Adelaide in 1993 which then travelled to Sydney as the launch exhibition for Boomalli’s new exhibition space, led to his work being acquired for the collections of the National Gallery of Australia and Flinders University. In addition, he was invited to participate in the 25th Budapest Autumn Festival in 1993 with Boomalli artists Judy Watson and Fiona Foley. That same year, Harry was invited to participate in Australian Perspecta 1993 at the Art Gallery of New South Wales and during November, undertook a residency at the Gallery in November, often speaking to gallery visitors and students about his work. Five of the works created during this residency were subsequently acquired for the AGNSW’s Aboriginal Art Collection and are currently on display at the Gallery. 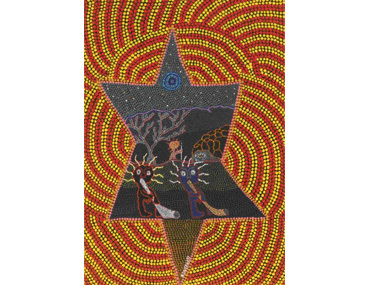 In 1994 Harry’s work toured Australia and to Britain in the exhibition True Colours: Aboriginal Artists Raise the Flag. That same year he was also invited to participate in Don't Leave Me This Way: Art in the Age of AIDS, an international exhibition organised by the National Gallery of Australia and Power of the Land: Masterpieces of Aboriginal Art at the National Gallery of Victoria. In recent years, Harry’s work has been included in the 2002 Biennale of Sydney at the Museum of Contemporary Art, Sydney and Colour Power: Aboriginal art post 1984 at the National Gallery of Victoria in 2004. In 2007 he was invite to contribute to Culture Warriors, the First National Indigenous Triennial at the National Gallery of Australia which toured nationally and to the United States. Harry’s last major body of work was produced for the 2009 exhibition Marella: The Hidden Mission which was developed by Penrith Regional Gallery and toured to Moree Plains Gallery and Cowra Regional Art Gallery. Harry’s work is currently featured in the international touring exhibition Message Stick: Indigenous Identity in Urban Australia which is produced by Artbank in partnership with the Department and Foreign Affairs and Trade. Launched in 2010, the exhibition will be touring through Asia in 2013 and will then return to Australia to tour to regional galleries in New South Wales, Queensland and Victoria, opening in Harry’s home town of Cowra in March 2014. Aside from his distinguished exhibition history, the monograph, Wiradujuri Spirit Man was published in 1996 with essays by Brenda L Croft and Judith Ryan and an accompanying transcribed personal history. 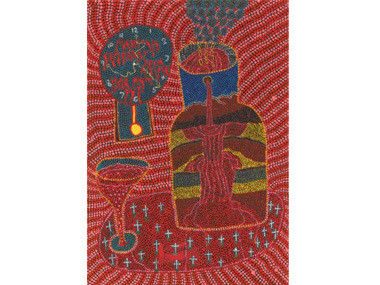 Harry's painting Not Accepting the Bible was used for the cover of Midnight Oil’s 1993 single 'Truganinni'. Harry is survived by his son, Harry Jnr, his sister Rodinna and brother Warren. Family and friends are invited to attend the funeral of celebrated Harry (HJ) Wedge on Wednesday 14 November at 11am at St Raphael’s Church, corner of Kendall and Lachlan Streets, Cowra. For those unable to attend letters of condolence and messages for the family can be sent to 22 Wollowra Street, Cowra NSW 2794 or emailed to carrie.kibbler@gmail.com for forwarding. Text by Matt Poll, Assistant Curator Indigenous Heritage, Macleay Museum, The University of Sydney and previous Artistic Director of Boomalli Aboriginal Artists Co-operative and Carrie Kibbler, Curator and Collection Manager, Artbank and curator of Message Stick: Indigenous Identity in Urban Australia.